Suspect you have a Bee Infestation? - Yes Pest Pros, Inc. Suspect you have a Bee Infestation? - Yes Pest Pros, Inc. Suspect you have a Bee Infestation? Bees are often pictured as cute and charming, gracing the pages of children’s books and gardening attire. Bees are certainly beneficial to the garden, but when they infest your home and living space, they can cause serious problems. Know what to look for and what to do if you suspect you have a bee infestation. A few bees buzzing around your garden flowers are healthy. There’s no need for concern if you notice a few fuzzy black and yellow bees pollenating flowers outdoors. What you need to worry about are carpenter bees which take their name from the fact that they burrow into the wood in your home and build their colonies inside your walls. If you hear humming when the house is quiet, you may have a colony or two already multiplying in your home’s walls. They will actually burrow into the woodwork and use the wood pulp in the formation of their nest. So if you notice odd tunnel-like gouges in your wood, take note. You may also see dead bees inside your home. 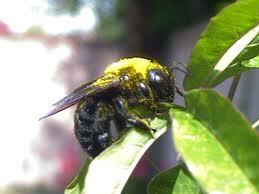 They’re typically black with a yellow stripe and resemble bumble bees, only smaller. Don’t waste time buying sprays and chemicals. The best thing to do if you suspect carpenter bees are taking over your home is to call in an exterminator. The infestation may be much bigger than you think and if left untreated can become a really expensive hassle. If you’re searching for pest control, you’re in luck. Young Environmental Solutions services Elkhart, Bloomington, Granger and South Bend. We’ve got the entire area covered. When you call in a bee exterminator, your bee problem is under control in no time.